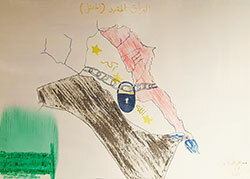 A new exhibit in Randall Library’s Curriculum Materials Center features artwork found in an elementary school in the Iraqi city of Fallujah in 2006. Master Gunnery Sergeant Paul McGowan of the United States Marine Corps requested permission to preserve the art, which he felt was important because it captured children’s perceptions of a prolonged war in their country. The collection came to the attention of Watson College faculty member Gerry Zinner in January. McGowan’s wife, Kim, is a graduate student enrolled in the Master of Arts in teaching in elementary education program at the Watson College. She shared the art as part of Zinner’s advanced social studies course assignment on the use of historical artifacts in the elementary classroom. Zinner encouraged Kim to showcase the children’s pictures as a means of demonstrating how art can serve as a powerful vehicle for expression for young children. The exhibit, developed by McGowan and Zinner, in collaboration with MGySgt McGowan and CMC coordinator Kathryn Batten will be on display in the Curriculum Materials Center through the end of April. The CMC is located on the main floor of the education building on campus. 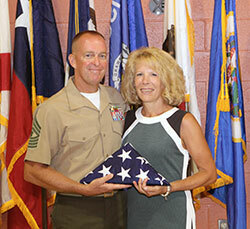 MGySgt McGowan retired in September 2016 after a 30-year career in the United States Marine Corps. His service, and that of other Marines in the 1st battalion of the 24th marine regiment, was portrayed in a documentary series titled, “Michigan’s Band of Brothers.” The video series, created for the Detroit Free Press, by the late David Gilkey, Stephen McGee, Kathleen Galligan, High Grannum, John Masson and Joe Swickard, won an Emmy award in 2006. An overview MGySgt McGowan authored for the exhibit is included below. In 2006, I was stationed in a forward operating base (FOB) in the city of Fallujah, Iraq. We often set out on foot patrols out of the west gates of our FOB. This would take us directly into the city and past an elementary school. On several occasions our patrols took sniper fire from the school building. On one occasion, we entered the school to search it. While going through the school we came across the art of the Iraqi students, laying in heaps on the floor. In lieu of the artwork being destroyed, I decided to save it from destruction. I took several pieces of the artwork and rolled it up and returned it to our FOB. Our intelligence cell, for intelligence purposes, inspected the art. 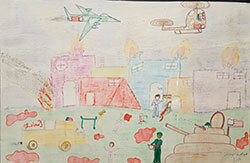 It was determined that the art represented the children’s feelings about the ongoing war in their country. I was, therefore, allowed to keep the artwork. Fallujah is in the Sunni town of Anbar Province. It is located about an hour northwest of Baghdad, the capital of Iraq.